Who guards the guards? In the case of the Federal Reserve, a watchdog over the economy, that question has new meaning. The Fed is all that shields us from fiscal chaos, right? No. According to Jacobs (Chair, Political Studies/Univ. of Minnesota; co-author: Who Governs? : Presidents, Public Opinion, and Manipulation, 2015, etc.) and King (American Government/Oxford Univ. ; co-author: Sterilized by the State: Eugenics, Race, and the Population Scare in Twentieth-Century North America, 2013, etc. ), the Fed introduces its own kind of chaos by implicating too much of the economy in the machinations of the financial sector, which itself is too large a part of the economy. The Fed, “a mutant institution of government,” has two fundamental charges: to keep prices stable and to maximize employment. It has taken to tending mostly to the former, “tweaking the economy during sharp downturns,” when inflation is low and short-term stimuli are efficacious. In the case of the last downturn and its long-tail aftermath, the response has been to lower the interest rate to almost nothing, which does not necessarily stabilize prices. The reliance of the Fed on financial markets and its usual strategy of buying and later selling Treasury bonds means that it has become a financial player—and that numbers game, write Jacobs and King, “produces winners and losers.” Given the institution’s autonomy—though “not immune from intervention,” the Fed successfully shook off controls imposed by Dodd-Frank—this risky behavior has become an unregulated norm. However, it was not always this way. 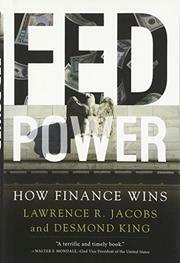 The authors observe that public involvement in financial policy was once much greater, with widespread debate over such things as “the relatively arcane issue of whether gold or silver should backstop the dollar.” While cautioning that they are not libertarian enemies of the Fed per se, they add specific recommendations for regulatory reform. Accessible and, though of interest largely to fiscal policy wonks, a careful argument for balancing sound financial management and the public interest.